Note: All photographs appearing on this page are freely usable for any purpose. Links to high-resolution versions of the pictures appear below each picture. Full documentation including System Requirements Specifications (SyRS), Hardware Requirements Specifications (HRS), Hardware Inspection list (HI), Hardware Test Cases (HTC), Hardware Test Procedures (HTP), Hardware Design Description (HDD), and (reverse) Traceability Matrix (RTM) are available for the DAQ system, including this board. Note: If you only want a few PPOpto-12 PCBs, contact Plantation Productions (randy@plantation-productions.com) to see if there are any in stock. Bare boards are $25 each plus shipping; fully assembled and tested boards are $399 each. If you need more than a couple PCBs and you're not in a huge hurry, it costs about $150 (plus about 4-6 weeks) to have a set of 10 manufactured and shipped to you from China. I	use Seeed Studio Fusion PCD service (https://www.seeedstudio.com/fusion.html). 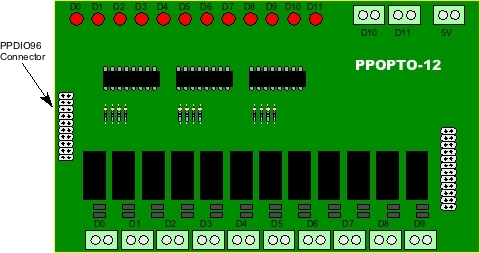 The PPOpto-12 PCBs are four-layer boards. Here are the Gerber files for them (provide these files to Seeed Studio or your personal PCB manufacturer). Here is a picture of the vertical DIN rail bracket and PPOpto-12 attached to a 35mm DIN rail. No picture for the horizontal DIN rail here, but the horizontal DIN rail is standard across all DAQ system boards. See the example on the PPDIO96 page if you want to see what the horizontal DIN rails look like. If you prefer, Plantation Productions, Inc., can provide a fully assembled and tested PPOpto-12 board with DIN rail brackets (horizontal and vertical) for $399. Contact randy@plantation-productions.com for more details. In theory, you could use a PPOpto-12 board independent of the DAQ system. The PPDIO96 connector contains 12 signal lines and 8 ground lines. The signal lines are TTL-logic compatible (5V) and reflect the state of the corresponding isolated input on the PPOpto-12 board. 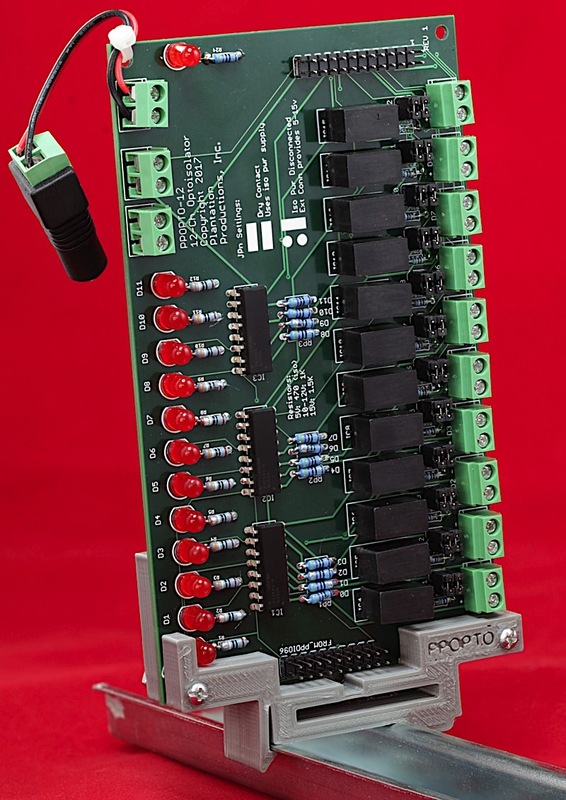 In practice, the PPDIO96 connector attaches to one of the eight banks on a PPDIO96 board. When connecting inputs to the PPOpto-12 screw terminals, there are a couple of issues to consider. 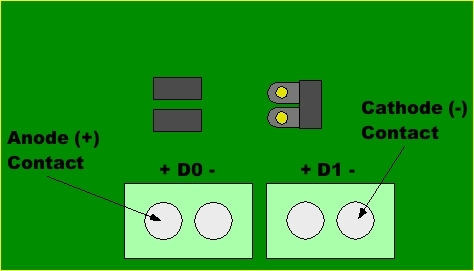 First of all, you must have the two jumper pins associated with each channel set according to the type of input. For dry contact inputs (switches, relay contacts, and other "wire" connections that don't supply a voltage level) the jumper pins must have two jumpers installed in the horizontal orientation. For logic level inputs you must have one jumper installed in the vertical orientation on the right side of the jumper block. Note that in "dry contact" mode, the PPOpto-12 board routes 5V from the CRL2S 0505SC isolated power supply onto the screw terminals (and input headers). Closing the switch contact connects the (isolated) 5V output from the CRL2S to the LED inside the PS2502-4 and activates that circuit. Opening the switch disconnects 5V and turns the internal LED off (thus registering a '0' on the output of that circuit). This implies that the circuitry attached to the opto-isolator input (screw terminals or 24-pin header) must be able to tolerate 5V and not affect that voltage (which is largely the definition of a "dry contact" input). Note that R13-R23 (100 Ω 1/2W resistors) exist to guarantee that the CRLS isolation power supplies are consuming at least 10% of their rated current/power. These power supplies are not regulated and will generate a much higher voltage (up to 15V) if they are supplying at least 10% of their rated power (2W). You can substitute a 220 Ω or 390 Ω 1/4 watt resistor in place of the 100 Ω 1/2W resistor. This will raise the output voltage of the CRLS 5V-5V isolation power supply by about 0.75V. For dry contact inputs, this won't matter at all and the board will wind up consuming significantly less power. 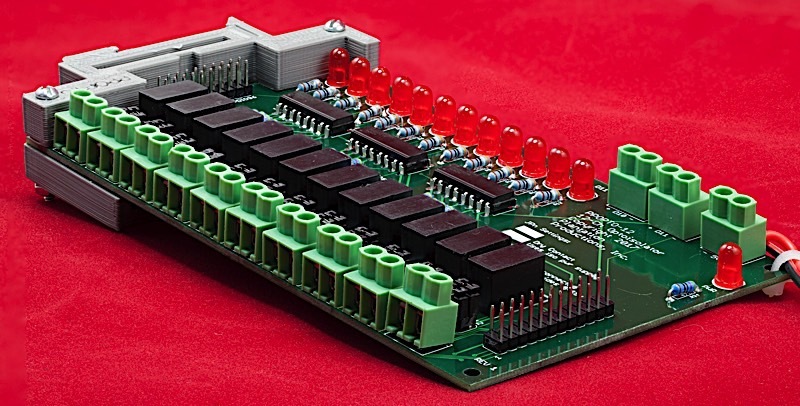 In "logic level" mode, the PPOpto-12 bypasses the isolation power supply completely and feeds the voltage level to the LED inside the PS2502-4 IC. For a TTL/5V logic level input, the PS2502-4 sees exactly the same voltage levels as in dry contact mode (as the CRL2S isolation power supply provides 5V). Because the PPOpto-12 inputs (in logic mode) drive an LED, polarity is very important. The terminal on the left side of each screw terminal is the anode (+) terminal. The terminal on the right side of each screw terminal is the cathode (-/Gnd) terminal. Note: if a particular input channel on the PPOpto-12 board will always be used in logic level mode, you can save yourself a little money by not populating the CRL2S 0505SC module for that channel. The CRL2S modules run $10-$20 (US) and represent the most signficant cost in the BOM. For system (and human) safety reasons, you should not normally apply more than about 30VDC to the inputs on the PPOpto-12 board. In addition to the 12 screw terminal inputs, the PPOpto-12 also includes a 24-pin header with 12 pairs of pins wired in parallel with the screw terminal inputs. Note that the cathode pins would normally be connected to the signal's ground while the anode pins (+) are connected to the signal itself (when using logic level inputs). 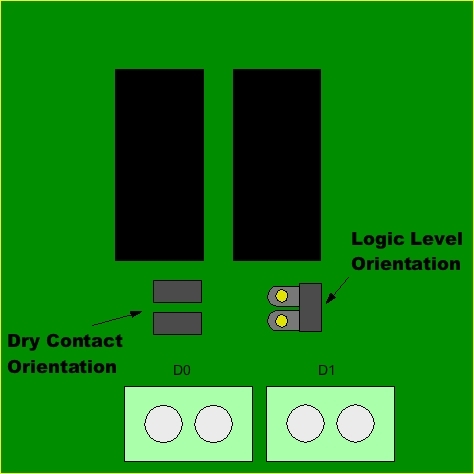 For dry contact inputs, the connection is arbitrary (dry contacts aren't polarized).